An extremely rare 1914 bisque portrait doll sold for $168,000 (inclusive of 12% buyer’s premium) at Frasher’s Doll Auctions July 9 auction in Kansas City, Mo. Sculpted by renowned French artist Albert Marque (1872-1939), the doll was originally commissioned for the Paris boutique Margaine-Lacroix. The buyer, who beat out four phone bidders and additional on-site bidders at the KCI-Expo Center was new to Frasher’s client roster. “The winning bidder is a collector of French dolls and German character dolls, and they obviously go for the very best,” said Barbara Frasher, president of Frasher’s Doll Auctions. As noted by doll historians, during World War I, Albert Marque was persuaded by Parisian couturier Jeanne Margaine-LaCroix to sculpt 100 fashion dolls, each signed, numbered, and clothed in a custom-designed costume representing royalty or a particular region of France. The 22-inch dolls were celebrated by the French not only as important artworks but also as cultural icons that stood up to the influx of wartime dolls from Germany. Frasher said the quality of sculpting on the doll is “exquisite … You can tell it was the work of an accomplished sculptor, not only from the quality of the doll’s head, but also the hands. The bisque head and limbs were added to a uniquely flared torso designed by French artist Aristodema Botta. The entire presentation is very unusual.” The doll was a popular attraction at the auction preview, Frasher said, because many collectors had never before had the opportunity to examine a rare A. Marque doll in person. In 1993, Frasher’s made headlines with another French doll. The rare, 23½-inch exhibition model depicting an elegant Creole lady was produced by Jumeau expressly for the 1884 World Exposition in New Orleans. At Frasher’s, it sold for $231,000, and in so doing, set a world auction record for a French doll — a record that remained unchallenged for 17 years. 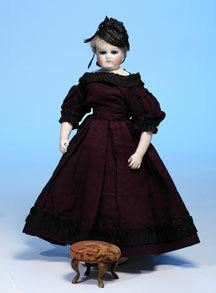 The A. Marque doll sold July 9 came from one of three private collections featured in Frasher’s 277-lot sale. After the event, which grossed $418,670, dolls were shipped to buyers throughout the United States as well as to Russia, the United Kingdom, Australia, Italy, France, Germany, and the Netherlands. Barbara Frasher noted that approximately 20% to 25% of the sale was sold over the phones, with significant underbidding from the Internet. 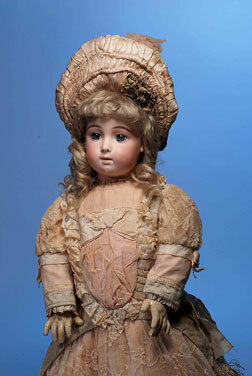 The top lot purchased online through LiveAuctioneers.com was a circa-1880 French bisque, wood-bodied fashion doll attributed to Louis Doleac, which realized $10,305. An especially nice 24-inch bisque Bebe Triste by Emile Jumeau, with finely painted facial features and blue paperweight eyes giving it a melancholy expression. 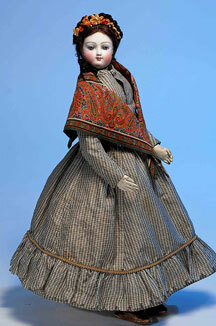 The doll settled at the midpoint of its estimate, selling for $15,680. Another fine Jumeau, a circa-1878 Premiere Bebe, was noted as being the earliest of its particular type. Described in the auction catalog as having “superb complexion, modeling, and expression, and exceptional eyes,” the 15-inch bisque featured an excellent original body, wore a fine fitted silk couture costume and bore a “Jumeau Medaille d’or Paris” stamp. It sold within estimate for $7,280. A circa-1850s Mme. Leontine Rohmer petite poupee, 14 inches in length, with rare swivel-neck design and almond-shaped cobalt glass eyes. Its all-original body included porcelain forearms. The coveted French fashion doll clothed in a deep-burgundy gown and straw bonnet exceeded its presale estimate to finish at $6,325. A classic 1872 Bru bisque poupee, 16 inches with “E” mark, $3,737. A petite Steiner bebe, 10½ inches with a label from the Parisian doll shop Au Nain Bleu, $3,920. 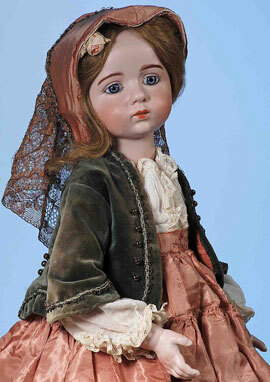 A highly sought-after model of the Emile Douillet Jumeau bebe with “E.D.” signature, $4,600. An 18-inch Francois Gauthier (F.G.) French bisque bebe with an “A La Tention, Guyot” shop label was bid to $5,040. Frasher’s Doll Auctions will hold its next event Nov. 5 and 6, 2011, again at the KCI-Expo Center. 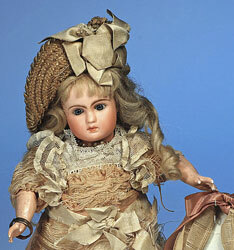 The approximately 300-lot sale will have a heavy emphasis on French and other high-quality dolls. The inventory will also include a large selection of vintage costumes, dresses, bonnets, and accessories. 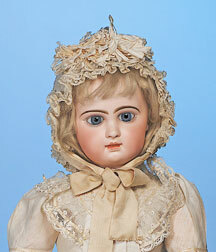 Quality consignments are currently being accepted for Frasher’s January auction in Scottsdale, Ariz., now a 20-year tradition with antique doll buyers. 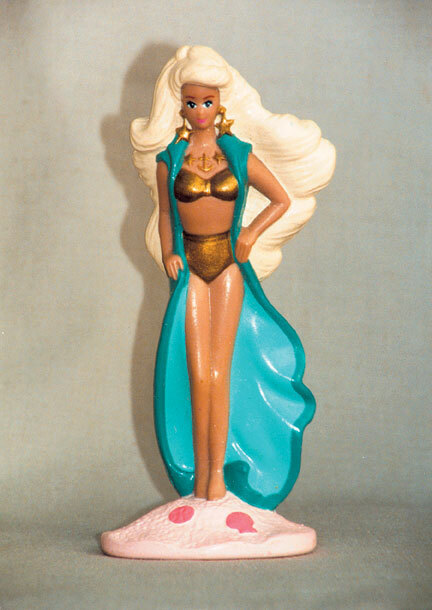 To contact Frasher’s Doll Auctions, call 816-625-3786 or e-mail frasher@aol.com. PreviousFarewell, Mr. Mattel: Toy tycoon Elliot Handler passes away at age 95. NextRevolutionary Road: Created to save humanity, a hero emerges . . . from the toy box. Joyce Greenholdt is the Editor of DOLLS Magazine.